A raging fire that tore through Notre-Dame Cathedral in central Paris was under control early on Tuesday after the blaze brought its towering spire and roof crashing to the ground, wiping out centuries of priceless heritage central to French culture and history. 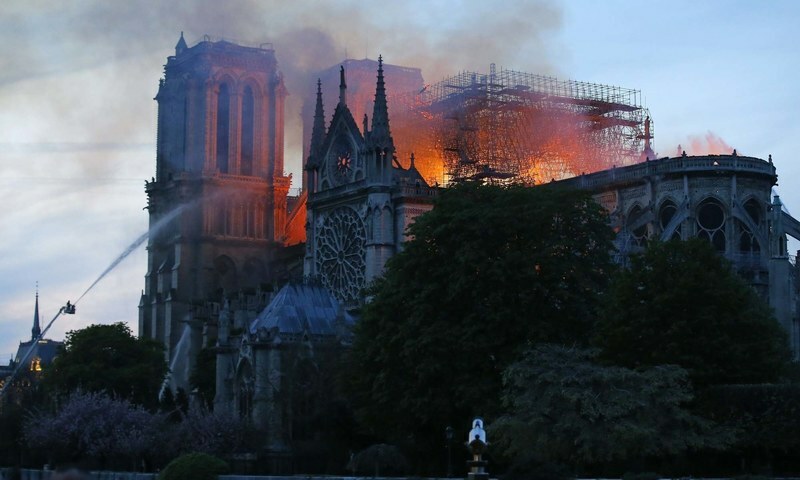 Paris fire brigade chief Jean-Claude Gallet said “we can consider that the main structure of Notre-Dame has been saved and preserved” as well as the two bell towers. 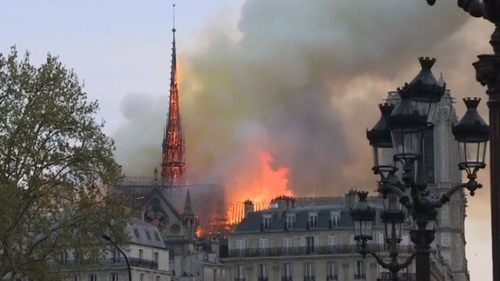 But “the whole of the roof has been devastated... a part of the vault has collapsed, the spire is no more”, fire brigade spokesman Lieutenant-Colonel Gabriel Plus said. 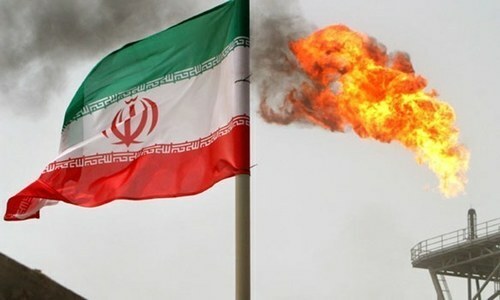 Laurent Nunez, state secretary at the interior ministry, told reporters early on Tuesday that with the immediate “danger of the fire over,” the focus would be on assessing the damage to the building's structure. Gasps and cries of “Oh my god” erupted around an hour after the fire first broke out when the top portion of the church's spire came crashing down. “If Paris is the Eiffel Tower then France is Notre Dame. It's the entire culture, entire history of France incarnated in this monument,” Bernard Lecomte, a writer and specialist in religious history told BFM TV. The privately run French Heritage Foundation has already launched a call for donations to help restore a “symbol of French history and culture.” Valerie Pecresse, president of the Ile-de-France region comprising the greater Paris region, said it would provide 10 million euros. And the head of a French lumber company told FranceInfo radio that it was ready to offer the best oak beams available to rebuild the intricate lattice that supported the now-destroyed roof, known as the “Forest”. “The work will surely take years, decades even, but it will require thousands of cubic metres of wood. We'll have to find the best specimens, with large diameters,” Sylvain Charlois of the Charlois group in Murlin, central France, told the radio. Paris Mayor Anne Hidalgo on Tuesday proposed organising an international donor conference to coordinate the pledges to restore the gothic architectural masterpiece. The United Nations' cultural agency UNESCO has also promised to stand “at France's side” to restore the site, which it declared a world heritage site in 1991. Pope Francis stands with France and is praying for Roman Catholics and Parisians alike after a devastating fire raged through the iconic Notre-Dame cathedral in the heart of the city,” the Vatican said on Tuesday. “The pope is close to France, he is praying for French Catholics and for the people of Paris in face of the terrible fire which has ravaged Notre-Dame cathedral,” the head of the Vatican press office Alessandro Gisotti wrote on Twitter. 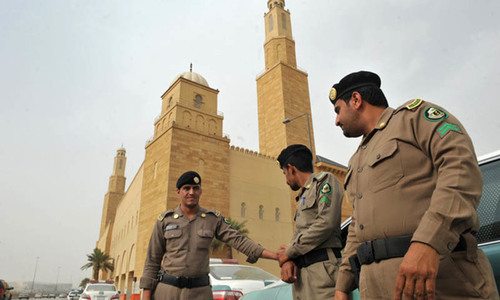 “He offers his prayers to those trying to face up to this dramatic situation,” he added. Pakistan also expressed its sorrow over the incident. “Paris is disfigured. The city will never be like it was before,” said Philippe, a communications worker in his mid-30s. Jacky Lafortune, a 72-year-old artist and self-described atheist stood forlornly on the banks of the River Seine staring at the burning cathedral. Comparing the mood in the French capital to the aftermath of a terror attack he said: “But this stirs much deeper emotions because Notre-Dame is linked to the very foundations of our culture. Historic Notre-Dame cathedral is a world heritage ---- rebuild Notre-Dame asap. Very sad to hear all this.A beauty lost. Nothing is immortal in this universe. 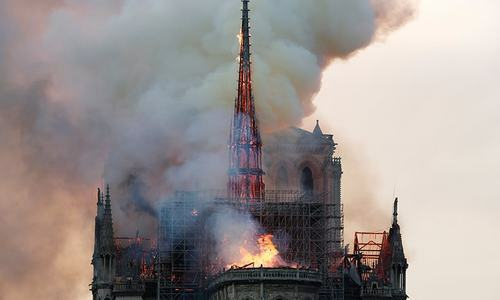 It was really sad to watch an historical landmark of Paris which survived so many wars was engulfed in a ruthless fire and the spire crashing down due to the uncontrolled flames. I'm sure the French will restore the majestic facade and the structure of the building. The restoration might take years. Sure it will be from cheap labour from as far as Romania and Bulgaria. Technical expertise from Japan and S.Korea. Building material from China, Taiwan. Wood from the Amazon rainforest. Plastic will replace stained glass windows. It would never look or smell the same my dear Mr Macron.